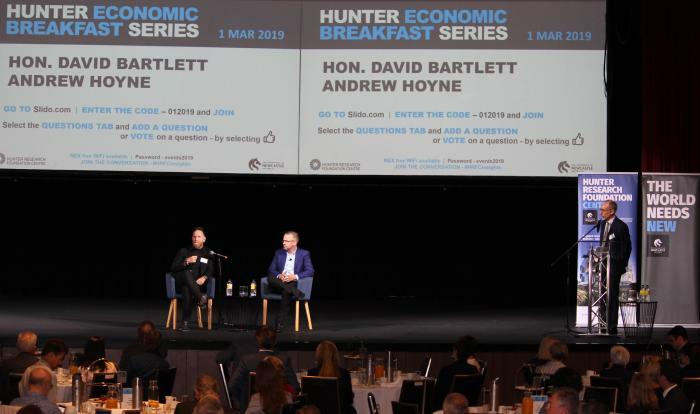 Economic and cultural benefits of investing in creative industries were discussed at the Hunter Economic breakfast on 1 March. Our guest speaker, the Hon. David Bartlett, talked about ‘the MONA effect’. The opening of the Museum of Old and New Art (MONA) in Hobart in 2011 boosted tourism numbers and spawned a range of other enterprises. Bartlett, Premier of Tasmania from 2008 until 2011, explained how MONA breathed new life into the State’s economy. Tasmania received 1.3 million visitors in the 12 months ending September 2018. Around 347,000 (27%) reported visiting MONA during their trip, up from 28,000 in 2010-11. Newcastle residents attend more arts events per ticket buyer than the national average, according to TEG Analytics, and they spend less per event. Newcastle also has a substantially greater share of people who attend arts events within the LGA – 41 per cent. The arts and creative industries that benefit from such attendance have the potential to play a central role in ‘place-making’ - improvements in city vibrancy, identity and tourism. Return on investment in creative industries is low, but building the creative sector is actually an investment in entrepreneurship, innovation and new ideas, Hoyne explained.People who use creative ideas to drive new economic activity have a hugely positive effect on the greater community. When creative economies are given the opportunity to flourish, you get better restaurants and bars, better night life and music scenes, and you end up with a more engaged community. Hoyne has seen huge investment in creative hubs, rejuvenated city areas and progressive business precincts in cities in the US. Cashed up IT companies are seeing the value, where recruitment and retention are critical issues. They want to be where smart young people are, who in turn want to be where the fun is.They prefer to be surrounded by like-minded people, entertainment and a variety of activities. On this front, creative prosperity is a core pillar. The HRF Centre will continue to facilitate such engagement with a broad range of stakeholders on questions that are critical to the region’s development. We seek to provide an evidence base of research and exemplars of global best practices to inform the decisions in government, business and the community.